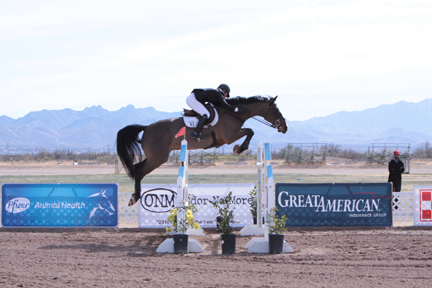 New Mexico's Elani Rager and Castor on course in Sunday's $25,000 HITS Grand Prix, presented by Pfizer Animal Health, at the HITS Arizona Winter Circuit in Tucson, Arizona. TUCSON, AZ (February 9, 2011)--Competition at the 2011 HITS Arizona Winter Circuit kicked off last week at the Pima County Fairgrounds in Tucson, Arizona with the first of six weeks of A-rated horse shows. Highlighting the week for High-Performance riders at the Sundance Welcome was Sunday’s $25,000 HITS Grand Prix, presented by Pfizer Animal Health, which was won by Elani Rager of Corrales, New Mexico and Lisa Upplegger’s Castor. Mike Gallaway, from Eugene, Oregon, set a first-round course that featured 13 efforts, including a double combination mid-way through the track and a triple combination at the end, with a time allowed of 86 seconds. Rager and Castor were first to go clean, and made their way through the track in 78.636 seconds. The next four teams failed to follow Rager’s lead and had faults at the double combination, which seemed to be the trickiest challenge put forth by Gallaway. HITS Arizona regular Bjorn Ikast of Laredo, Texas ensured that there would be a jump-off when he piloted Bovee Limited’s Colorado to a clear round. Four trips later, he went clean again aboard his second mount Brave Heart, stacking the odds in his favor for the jump-off. Gallaway’s jump-off consisted of six elements, including the double combination as the final obstacle which had given trouble to so many in the first round, and a time allowed of 48 seconds. Rager and Castor went first and raced through the course effortlessly, crossing the timers in 35.827 seconds to set the Great American Time to Beat. Ikast and Colorado were up next, and the pair had an unlucky rail down at the last fence in a time of 35.672 seconds. Ikast returned aboard Brave Heart looking to take the lead, but opted to retire after they knocked down the first fence and finished third in the class. Rounding out the top five were Janet Hischer of Scottsdale, Arizona and Monica Rahman’s Guiseppe in fourth place, and Allison Kroff of Green Valley, California and her own Washington in fifth place. High-Performance riders showing at HITS Arizona this winter will have five more opportunities to get an early jump on qualifying for this year’s Pfizer $1 Million Grand Prix which will take place on September 11 at HITS-on-the-Hudson in Saugerties, New York. In other news, last week at the Sundance Welcome HITS Arizona debuted its first $2,500 Devoucoux Hunter Prix and Allison Kroff, who finished fifth in the Grand Prix, took home the blue ribbon aboard Alexandra Strandberg’s Dutch, as well as the red ribbon aboard Chris Davis’ Paladin. The $2,500 Devoucoux Hunter Prix is a new addition to the HITS Arizona schedule and is a qualifier for the all-new Diamond Mills $500,000 Hunter Prix Final which will take place September 10-11 in Saugerties, New York. In Saturday’s feature class for hunters, Kroff used a first-round score of 78 and a second round score of 79 to win the class aboard Dutch with a total score of 157. Aboard Paladin, Kroff scored 77 in the first round and 77 again in the second round for a total of 154. Peter Lombardo of Riverside, California, rode John Zambrano’s Zumanity to a third-place finish with a total score of 150. Katie Gardner of West Lake Village, California took fourth place with a total score of 117 aboard Caitlin McGough’s Anteros and Samantha Waslewskie of Scottsdale, Arizona scored a total of 113 aboard her own Ademaro for fifth place. 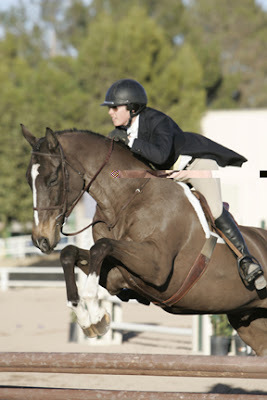 Kroff has been coming to the HITS Arizona Winter Circuit for a number of years and is happy to return this season with the team from Windfall Farm, another long-time supporter of HITS. “Everyone is excited to be here and so far all the horses are going really well," added Kroff. HITS Arizona will host a total of six Devoucoux Hunter Prix qualifiers for the Diamond Mills Hunter Final, including the $5,000 Devoucoux Hunter Prix which takes place on Saturday, March 12, during Week VI of the circuit. The all-new Diamond Mills $500,000 3'3" Hunter Prix Final is another innovative offering from HITS that has equestrians from around the country eager to earn their spot in this historic event, which takes place the same weekend as the Pfizer Million in Saugerties, New York. In order to become eligible for the Diamond Mills Hunter Prix Final a rider on any horse/horses will need to compete in five or more Devoucoux Hunter Prix at any combination of HITS Shows during the qualifying period. Once a rider has competed in five Devoucoux Prix, they will become eligible and the points on their leading horse will place them in HITS Hunter Prix Final Rider Rankings. For more information on the Diamond Mills $500,000 Hunter Prix Final, including complete qualifying specifications, please click here. Devoucoux, makers of fine French saddles, is proud to be the title sponsor of each and every qualifying Hunter Prix leading up to this year's phenomenal Diamond Mills $500,000 3'3" Hunter Prix Final. The Devoucoux Hunter Prix will be a featured event at all HITS horse shows this season as riders from around the country set out to qualify for the historic Diamond Mills Hunter Prix Final, which will take place September 10-11 at HITS-on-the-Hudson in Saugerties, New York. The HITS Arizona Lodging Partner Page features a complete list of affordable accommodations located close to the Pima County Fair Grounds for added convenience. To check availability and the great rates extended to HITS Customers, please visit: HitsShows.com/Arizona/Lodging.html#lodging. Show jumping continues this week at HITS Arizona with the Kachina Classic and continues until Sunday, March 13 with four more consecutive weeks of competition. For a complete schedule of competition, please click here. HITS, Inc. produces high-quality, international-level hunter/jumper horse shows. Based in upstate New York in the Village of Saugerties, HITS has been producing shows since 1982 and is now a nationwide company with world-class circuits in California, Florida, Arizona, New York and Virginia. 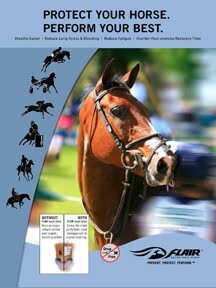 In 2010, HITS took the industry to new heights when it hosted the first-ever Pfizer $1 Million Grand Prix on September 12, in Saugerties, New York. 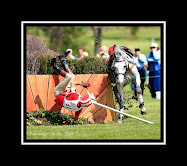 HITS will once again offer the most innovative weekend in show jumping history in 2011 when it hosts the second annual Pfizer Million and the inaugural Diamond Mills $500,000 Hunter Prix Final, September 10-11, at HITS-on-the-Hudson in Saugerties, New York. For more information and a complete schedule of classes and events, visit HitsShows.com. Stay connected with HITS, join us on Facebook or follow us on Twitter! 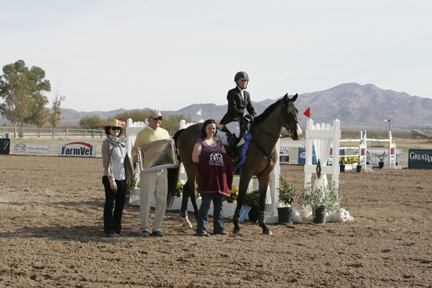 Elani Rager and Castro are congratulated by HITS' Joe Dotoli after they won the $25,000 HITS Grand Prix, presented by Pfizer Animal Health, at the HITS Arizona Winter Circuit. 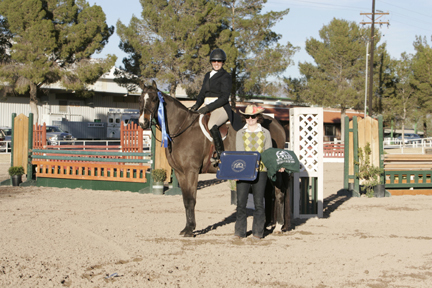 California's Allison Kroff and Dutch won the first $2,500 Devoucoux Hunter Prix at HITS Arizona. Allison and Dutch in the winner's circle after they captured Saturday's $2,500 Devoucoux Hunter Prix at HITS Arizona.